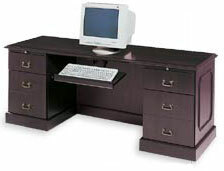 Because we have such a large facility, we are able to offer more new desk credenzas at lower prices than other companies. This means that new desk credenzas from ROF are available in a plethora of sizes, shapes, and colors. Plus, with all our new desk credenzas come our signature superior customer service and our commitment to quality, ensuring that you get the best possible deal for your money.